Inspired by Tess’s Halloween costume, and with an interest in improved visibility while I’m riding my bike at night, I made a minor modification to my front tire. This was also an excuse to finally use Sugru, a substance about which I’d heard a great many things but never had a reason to use myself. 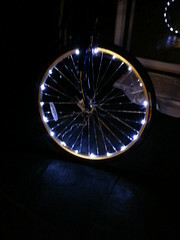 The stuff is extremely easy to use, and made attaching the LED lights to my wheel super simple. The battery pack is affixed to the spokes with simple zip ties. I’ll need to make some improvements on that, in order to be able to replace the batteries without having to cut the ties. I used a full pack (5 grams) of Sugru in order to mount the lights. I could probably have gotten away with less, but as this was my first application I decided not to be to stingy with the stuff. I have several more packs of Sugru left over, so I’ll likely add LEDs to my rear wheels, too! I rode the bike to work this morning and noticed more than a few people taking a look at my wheel. I definitely felt safer riding home in the dark knowing that I was a more visible object on the road.